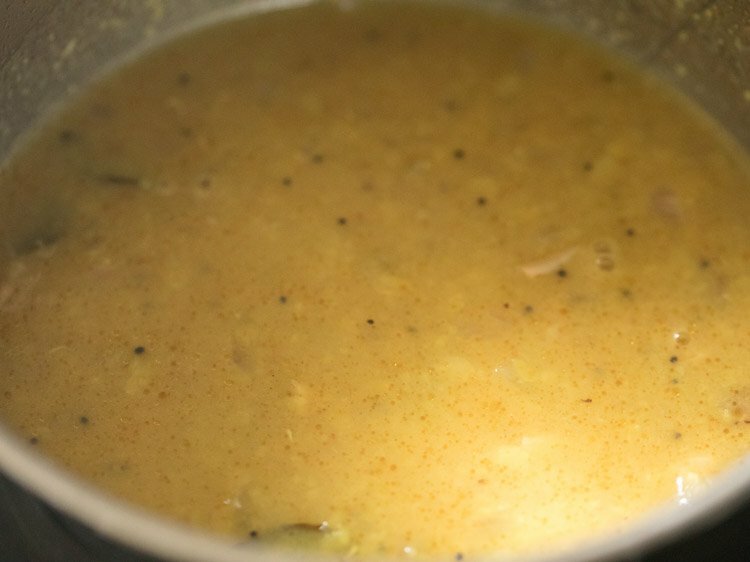 mamidikaya pappu is an andhra style dal made with raw unripe mangoes. mamidikaya pappu recipe with step by step pics. there are myriad ways raw unripe mangoes are used in the indian cuisine. 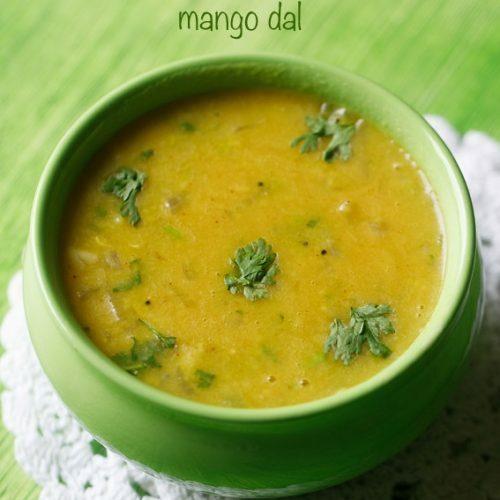 adding tart or sour mangoes to dal is one such way. this brings some sourness to the dal and tastes very good. 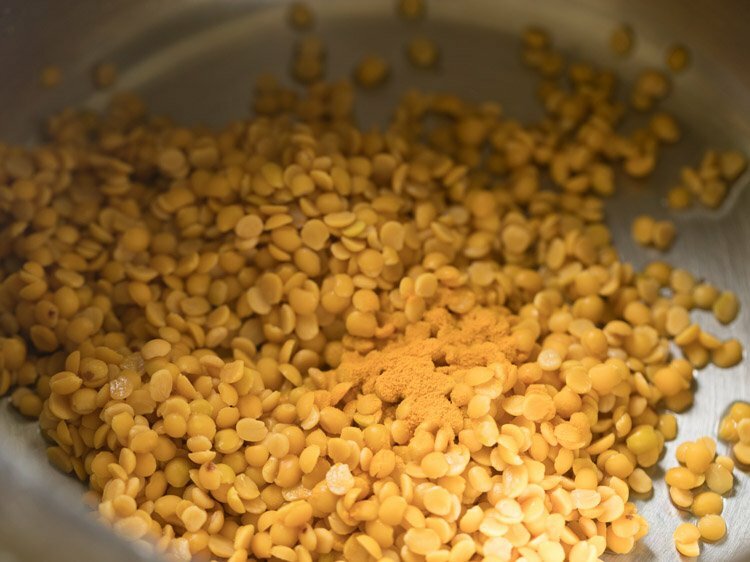 in this post i am sharing the andhra way of making mango dal. 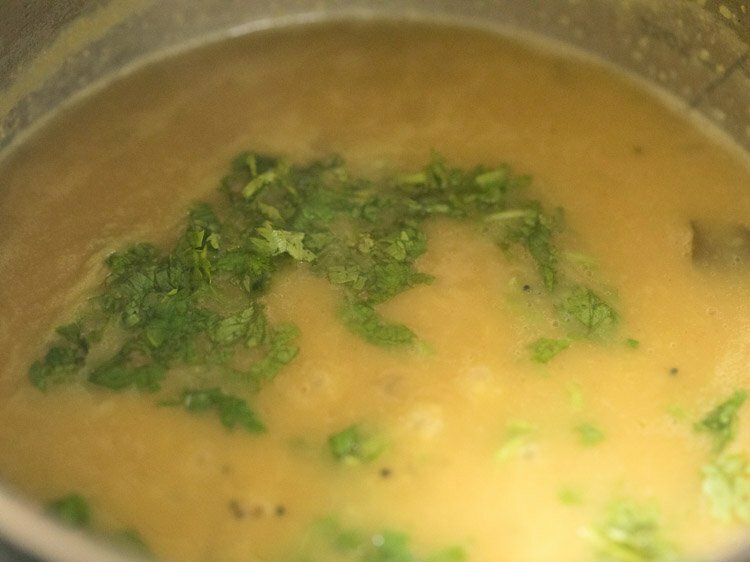 in telugu this khatta dal or sour dal is called as mamidikaya pappu. 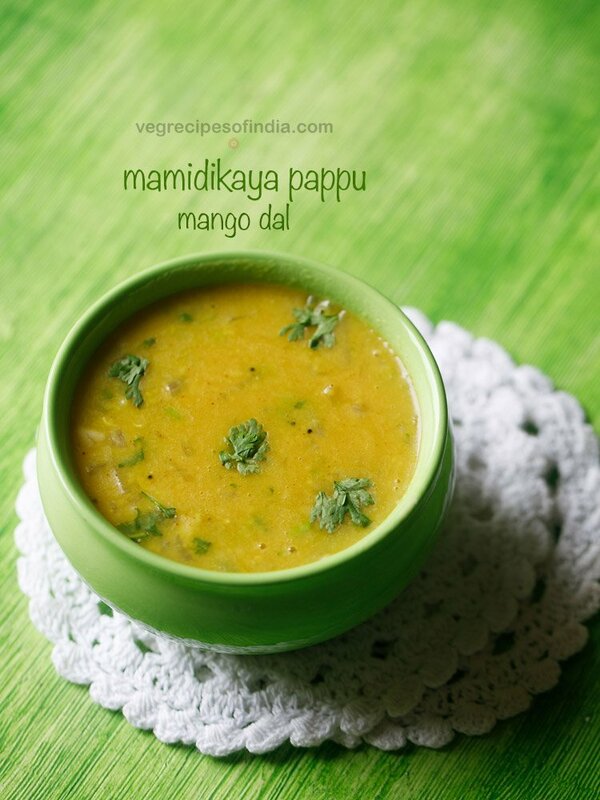 here ‘mamidikaya’ means mango and ‘pappu‘ means dal. on our recent trip to tirupati in andhra pradesh, we had a few varieties of andhra pappu (dals), some varieties of pulusu (tamarind based stews) and a few types of kura (curries). mamidikaya pappu was one such variation we had there. it was delicious, so i thought of making the recipe at home. usually i make another variation of mango dal with drumsticks and i have already shared this recipe earlier. 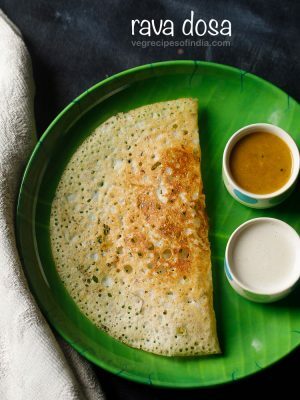 there are some variations in making andhra mamidikaya pappu. 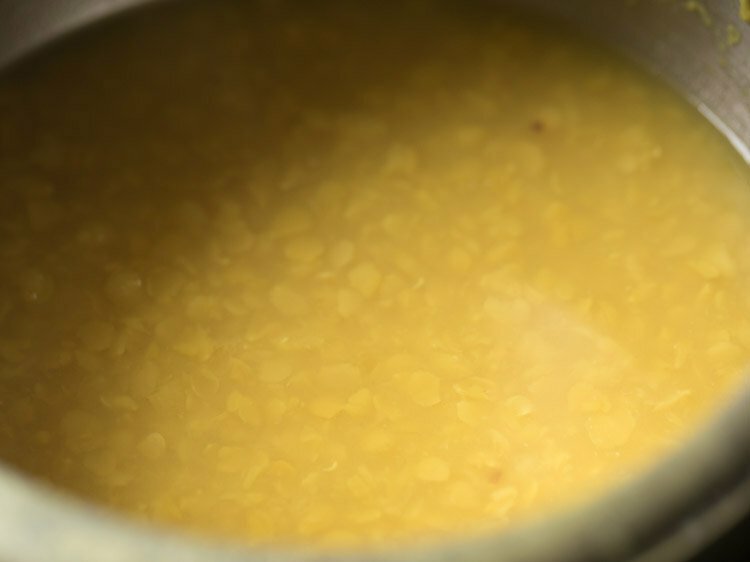 i have cooked the raw mangoes in a pan, but you can also cook them with the dal in the pressure cooker. i have used tuvar dal, but even moong dal can be used. 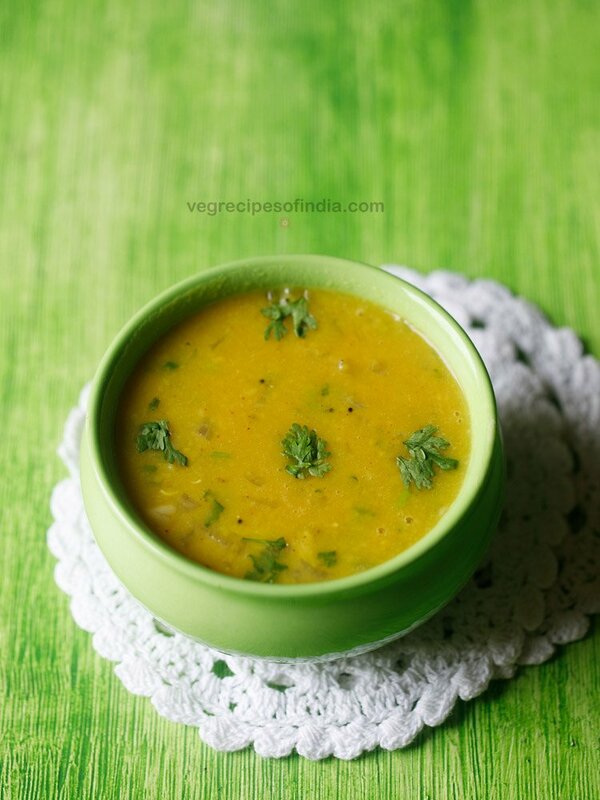 this dal can be made thick or with a medium consistency. 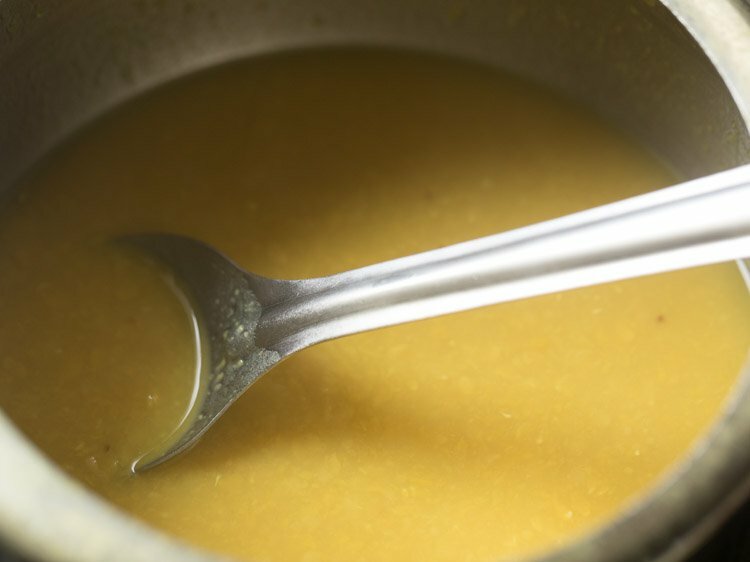 addition of mangoes makes the dal on the thicker side. so you can adjust the consistency by adding less or more water. you can choose what suits you best. 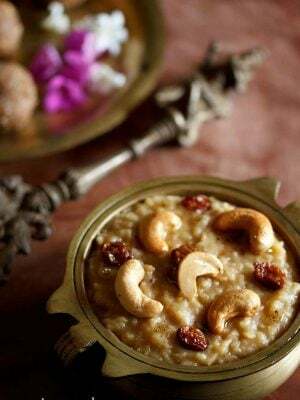 making mamidikaya pappu is easy and is best had with some steamed rice. 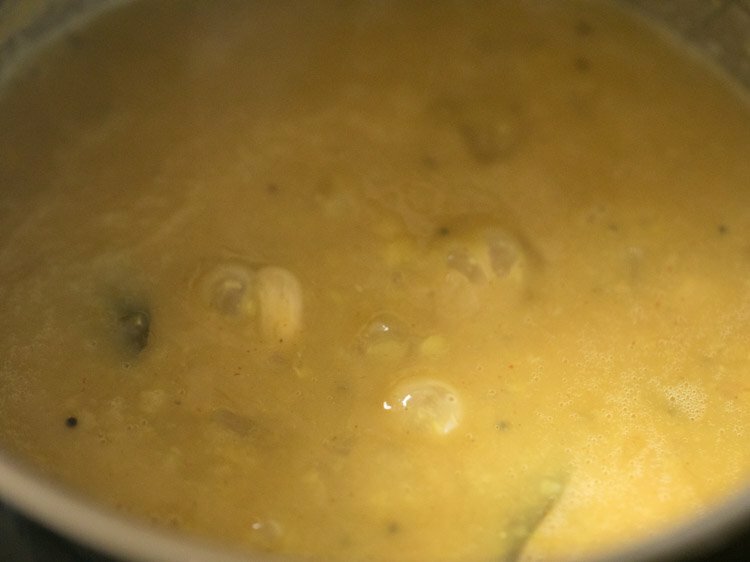 in a 3 litre pressure cooker, take ½ cup tuvar dal. add ¼ teaspoon turmeric powder. then add 1.75 to 2 cups water and mix everything. 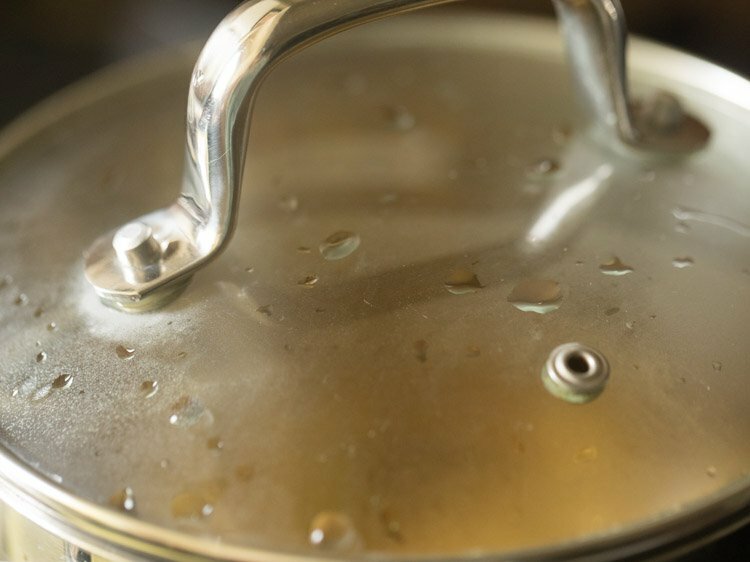 if using a smaller size cooker, then add less water. pressure cook on a medium flame for 7 to 8 whistles or for 10 to 12 minutes till the dal is cooked very well and mushy. 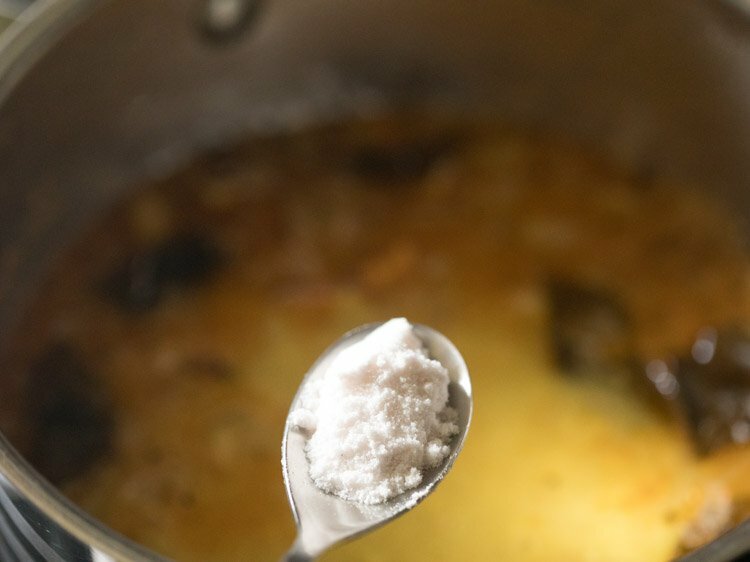 for a smaller cooker, less time will be required for cooking dal. 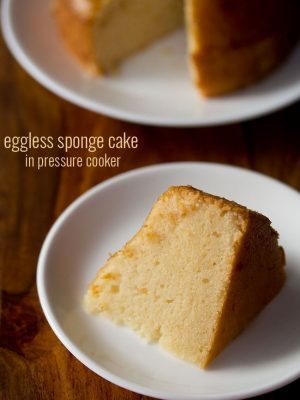 when pressure settles down on its own in the cooker, open the lid. mash the cooked dal with a spoon. keep aside. heat 2 tablespoons oil in a pan. 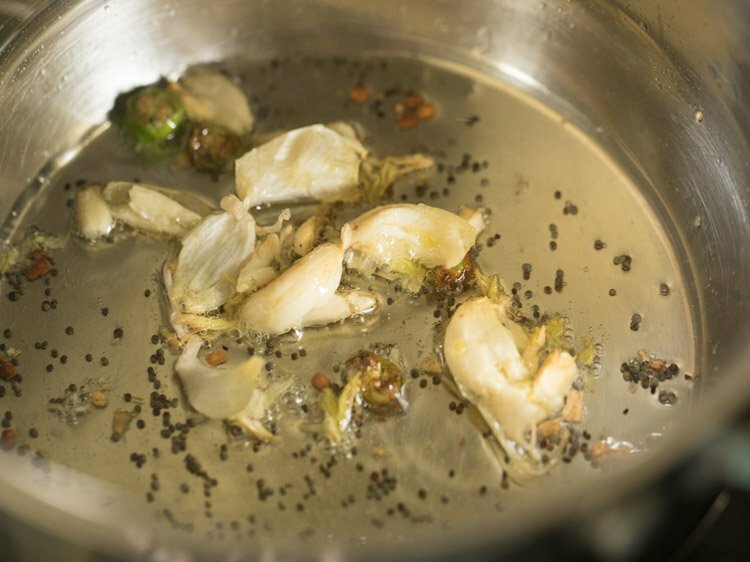 keep flame to a low and then add ½ teaspoon mustard seeds and let them splutter. then add 10 to 12 methi seeds and 1 green chili (chopped). instead of green chili, you can use 1 dry red chili (broken and seeds removed) or even can use both. fry till the methi seeds change color. keep flame to a low or if the pan has become too hot, then you can switch off the flame. then add 3 to 4 medium garlic cloves, crushed lightly or chopped. fry till the garlic turns light golden. 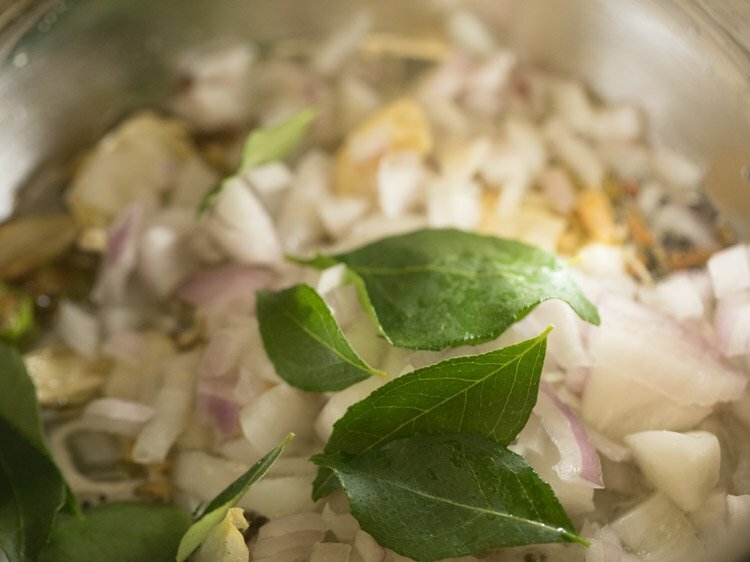 then add ⅓ cup chopped onions and 8 to 10 curry leaves. mix and begin to sauté onions on a low to medium-low flame till they turn translucent. 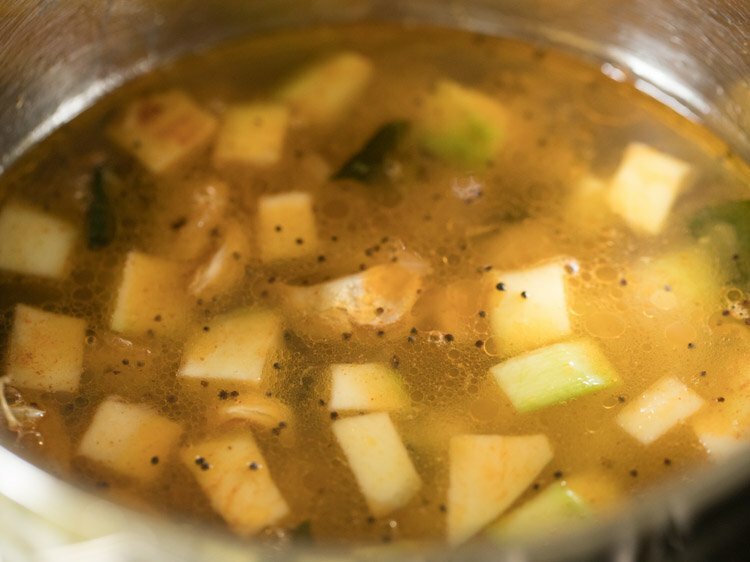 when the onions become translucent, add ½ cup chopped unripe raw mango cubes and ¼ teaspoon red chili powder. mix well. for a more spicy dal, you can add ½ teaspoon red chilli powder. then add 1 cup water. 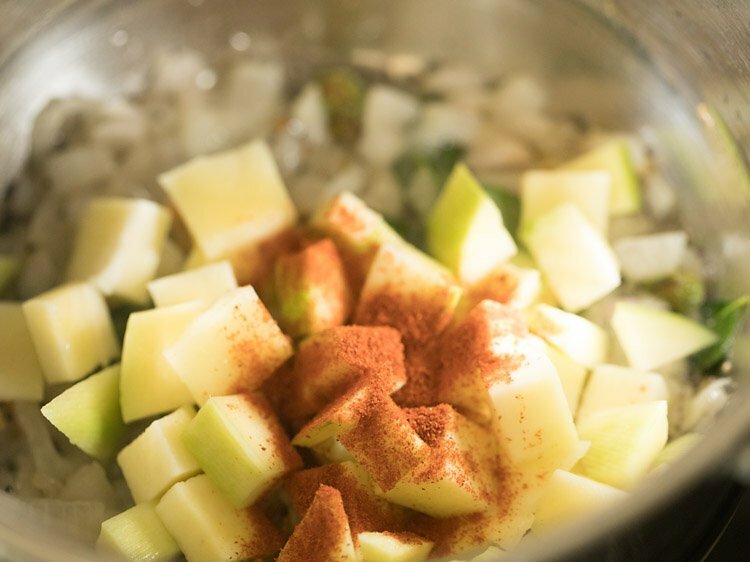 cover the pan and cook the raw unripe mango cubes till they soften. in between do check. cook till the mango pieces have softened. if you press the mango pieces, they should get mashed. now add the cooked dal. season with salt as per taste. mix very well. if the dal looks very thick then you can add some water. cook on a low flame for a few minutes or till the mamidikaya pappu comes to a boil. then switch off flame and add 1 to 2 tablespoons chopped coriander leaves. mix again. optionally you can garnish with coriander leaves while serving mamidikaya pappu. serve mamidikaya pappu hot with steamed rice. 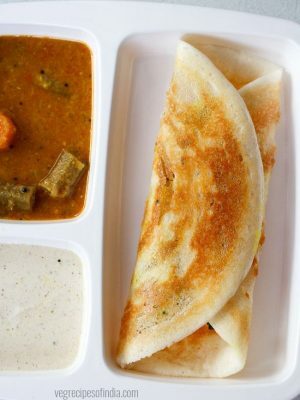 1. you can also make this mamidikaya pappu without onions and garlic. add a pinch of asafoetida and some ginger after frying fenugreek seeds (methi). 2. you can make the consistency of mamidikaya pappu as per your choice. add less water for a thicker consistency and some more water for a medium consistency. 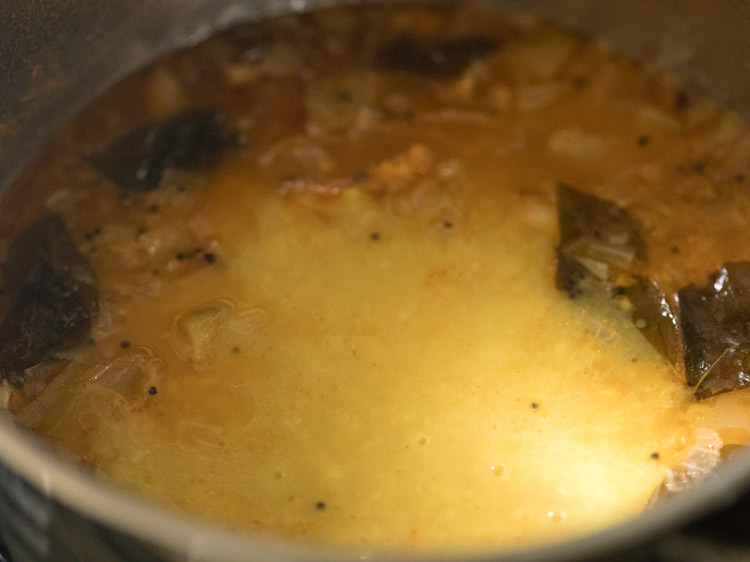 1. in a 3 litre pressure cooker, take ½ cup tuvar dal. add ¼ teaspoon turmeric powder. 2. then add 1.75 to 2 cups water and mix everything. 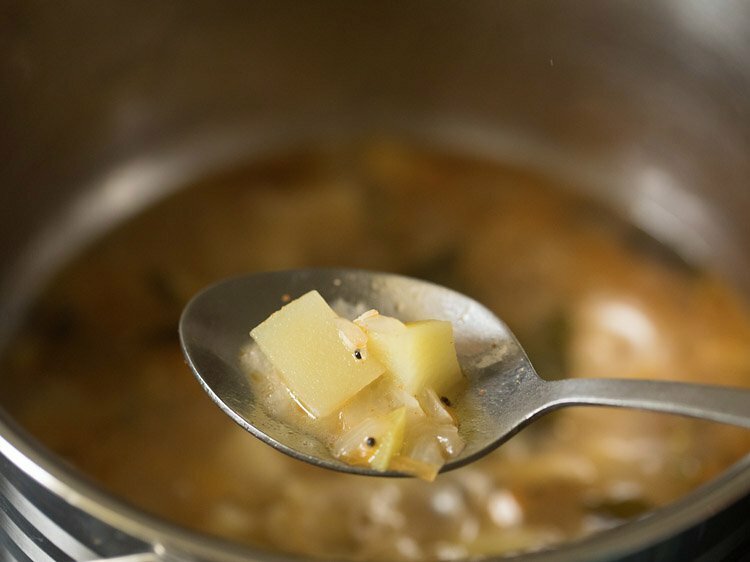 if using a smaller size cooker, then add less water. 3. pressure cook on a medium flame for 7 to 8 whistles or for 10 to 12 minutes till the dal is cooked very well. 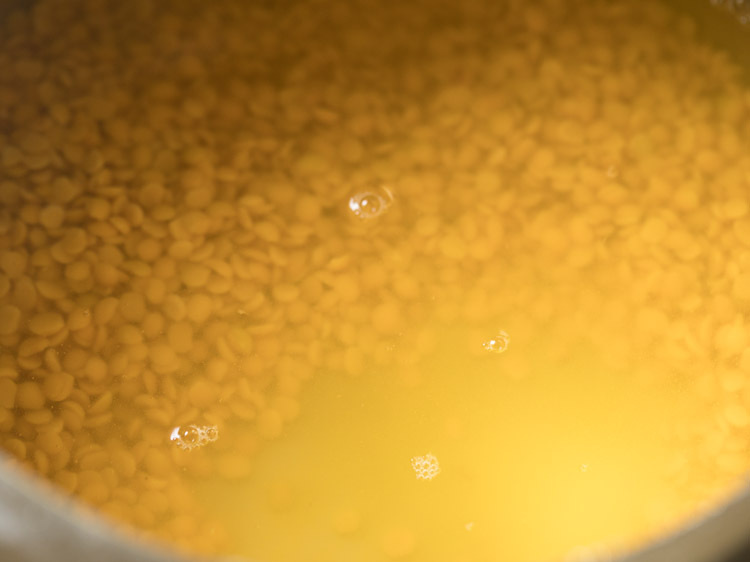 for a smaller cooker, less time will be required for cooking dal. 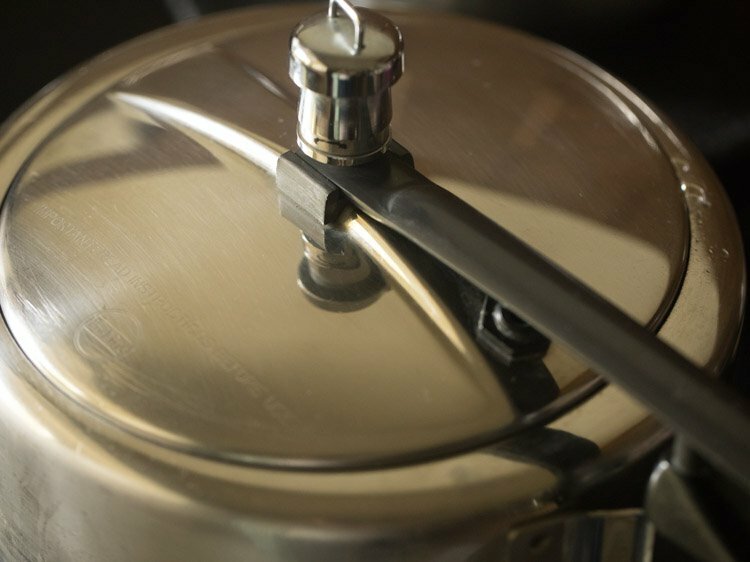 4. when pressure settles down on its own in the cooker, open the lid. 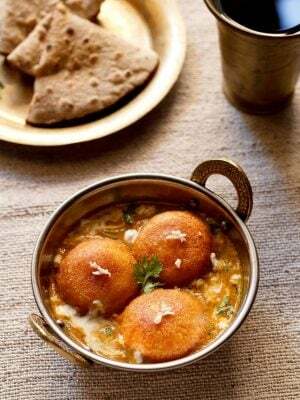 5. mash the cooked dal with a spoon. keep aside. 6. heat 2 tablespoons oil in a pan. 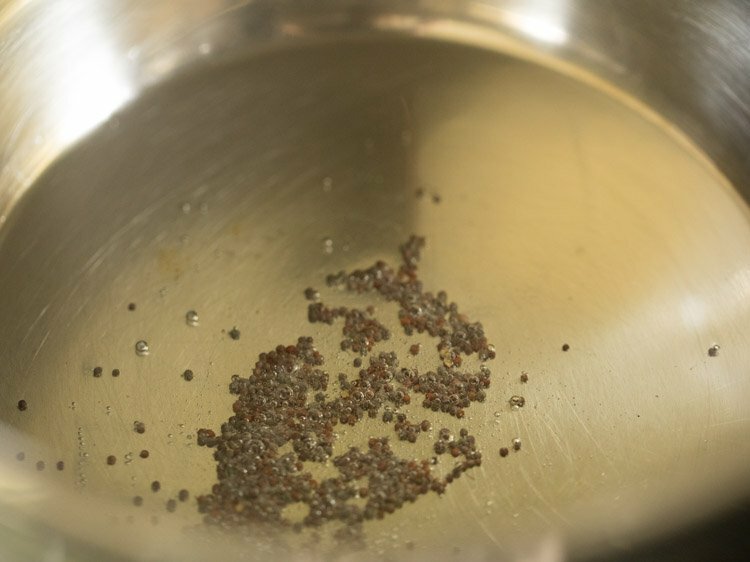 keep flame to a low and then add ½ teaspoon mustard seeds. let the mustard seeds splutter. 7. then add 10 to 12 methi seeds and 1 green chili, chopped. 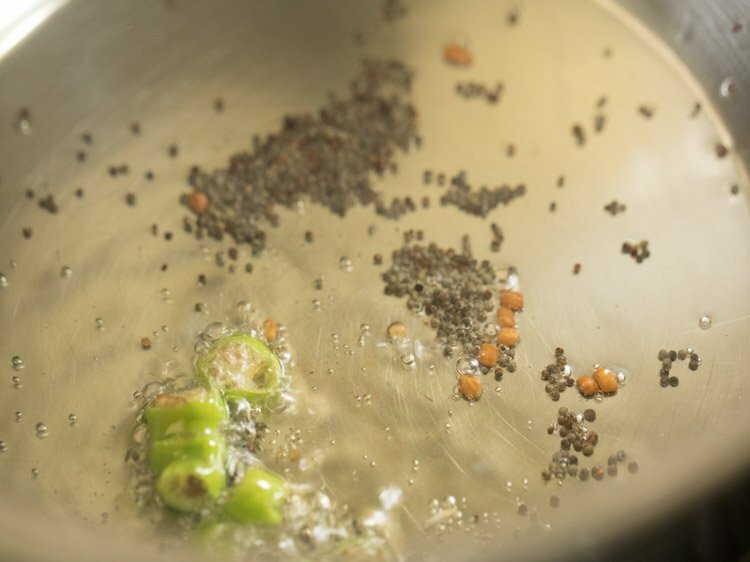 instead of green chili, you can use 1 dry red chili (broken and seeds removed) or even use both. 8. fry till the methi seeds change color. keep flame to a low or if the pan has become too hot, then you can switch off the flame. then add 3 to 4 medium garlic cloves, crushed lightly or chopped. 9. fry till the garlic turns light golden. 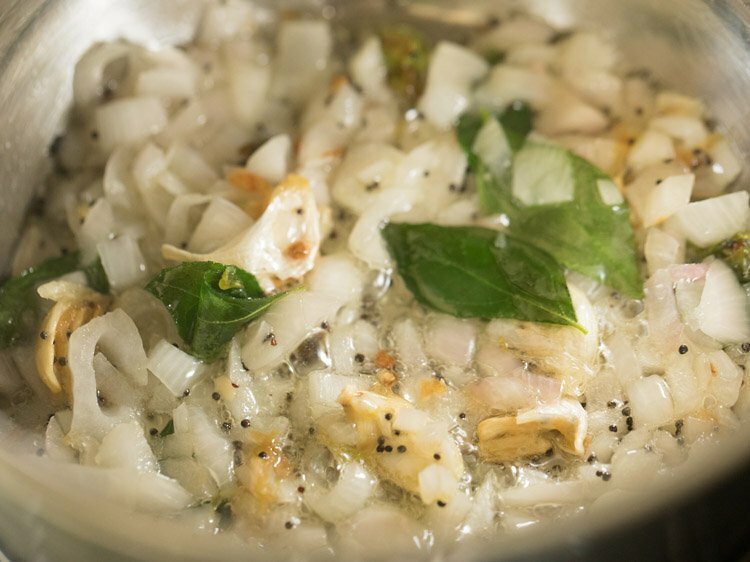 10. then add ⅓ cup chopped onions and 8 to 10 curry leaves. 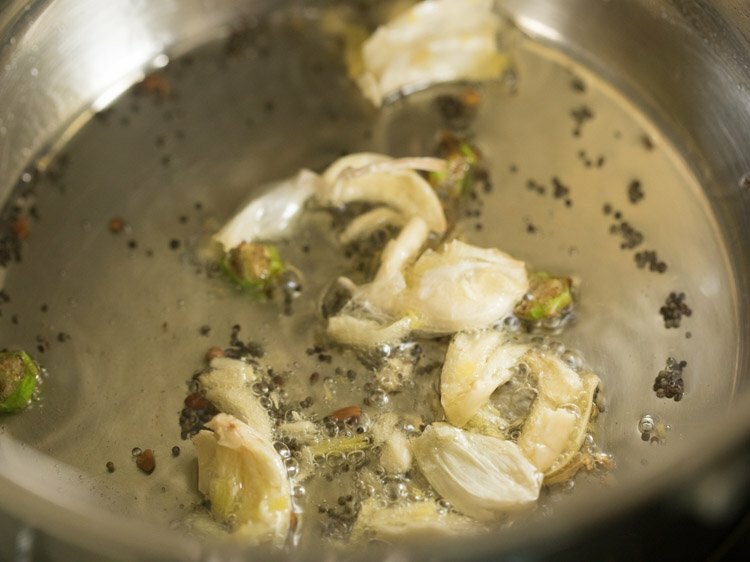 11. mix and begin to sauté onions on a low to medium-low flame till they turn translucent. 12. when the onions become translucent, add ½ cup chopped unripe raw mango cubes and ¼ teaspoon red chili powder. mix well. 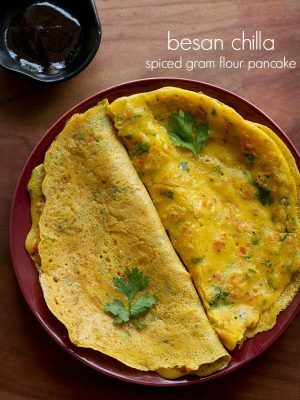 for a more spicy dal, you can add ½ teaspoon red chilli powder. 13. then add 1 cup water. 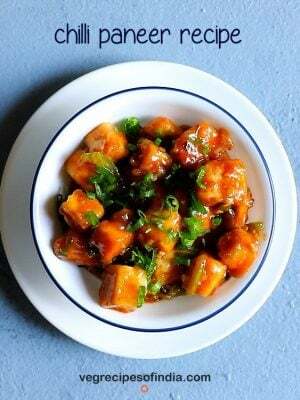 14. cover the pan and cook the raw unripe mango cubes till they soften. 15. in between do check. 16. cook till the mango pieces have softened. if you press the mango pieces, they should get mashed. 17. now add the cooked dal. 18. season with salt as per taste. 19. mix very well. 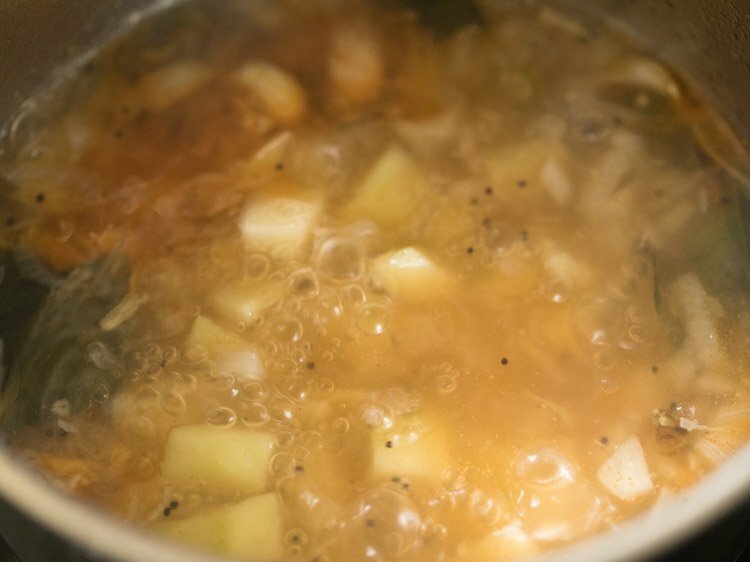 if the dal looks very thick then you can add some water. 20. cook on a low flame for a few minutes or till the mamidikaya pappu comes to a boil. 21. then switch off flame and add 1 to 2 tablespoons chopped coriander leaves. mix again. 22. serve mamidikaya pappu hot with steamed rice. you can boil raw mangoes separately. then blend and make a pulp/paste of them. do the tempering part, add the raw mango pulp. sauté for a minute. then add cooked dal. mix well and heat through till dal comes to a boil. add water if required if the dal is too thick. 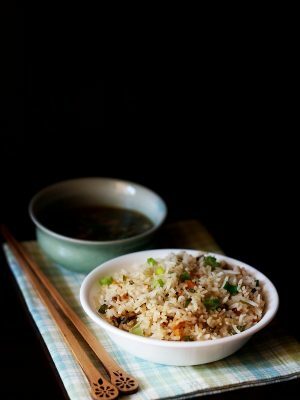 I have tried a lot of your recipes and have become more confident in trying other cuisines. Awesome job. Your passion for cooking and creating shines through! thank you charanya 🙏. glad to read your comment 😊. happy cooking and all the best to you.